This is one in a series of posts on the Nikon Z6 and Z7. You should be able to find all the posts about that camera in the Category List on the right sidebar, below the Articles widget. There’s a drop-down menu there that you can use to get to all the posts in this series; just look for “Nikon Z6/7”. This post is also about the Sony a7RIII; it’s in the drop-down menu, too. 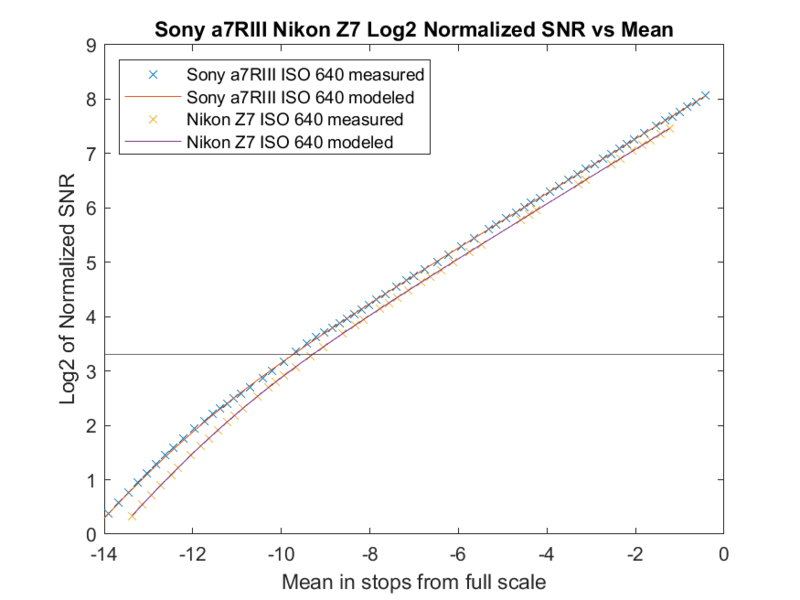 I’ve been comparing the normalized shadow noise of the Nikon Z6 and Z7. 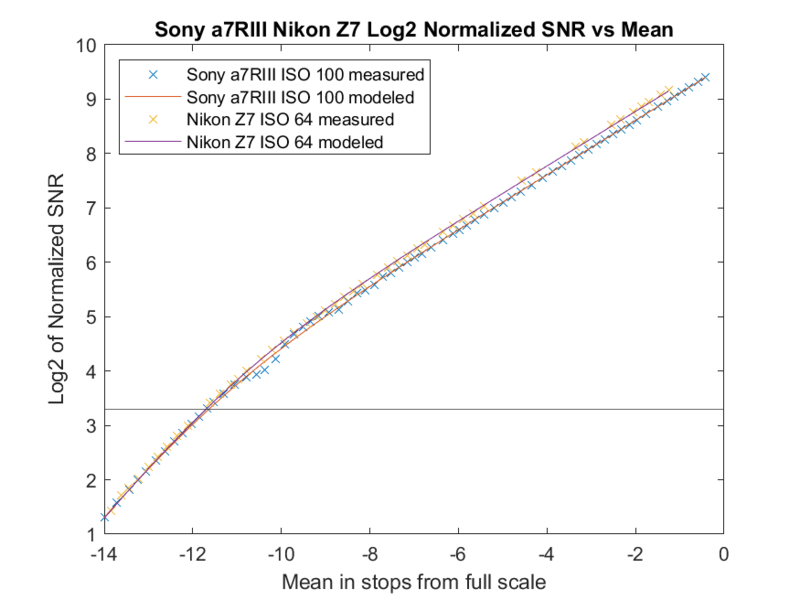 I’m going to change things up a bit and compare the Z7 to the Sony a7RIII, which occupies a similar place in Sony’s MILC lineup. I will compare the sensitivities of the two cameras to make sure that different ways of calibrating the ISO settings between the two manufacturers aren’t skewing the playing field, but I’ll start out accepting the ISO settings at face value. Base ISO on the Z7 is 64 and it’s 100 on the a7RIII. 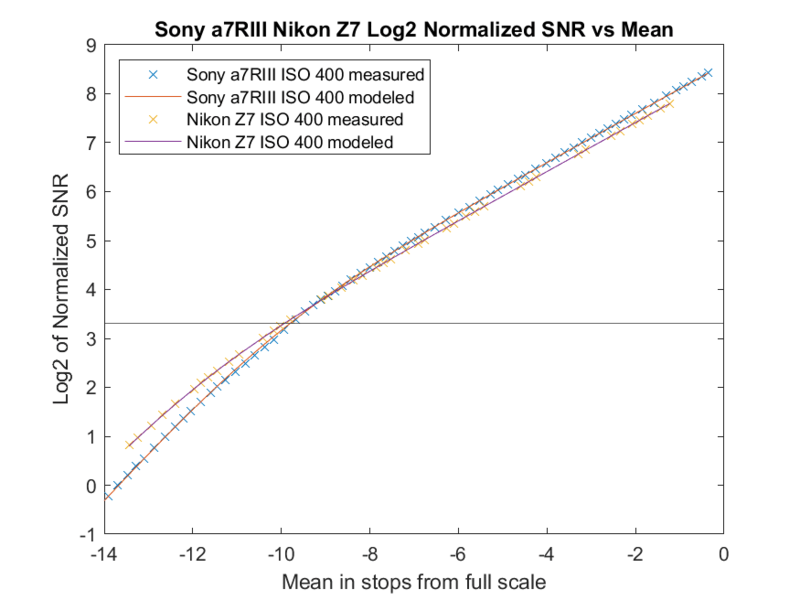 Here are normalized signal-to-noise ratio (SNR) curves for the two cameras a base ISO. Minimally acceptable SNR for small prints (about 8 inches high) is marked by the horizontal line that intersects the y-axis at 3.3. 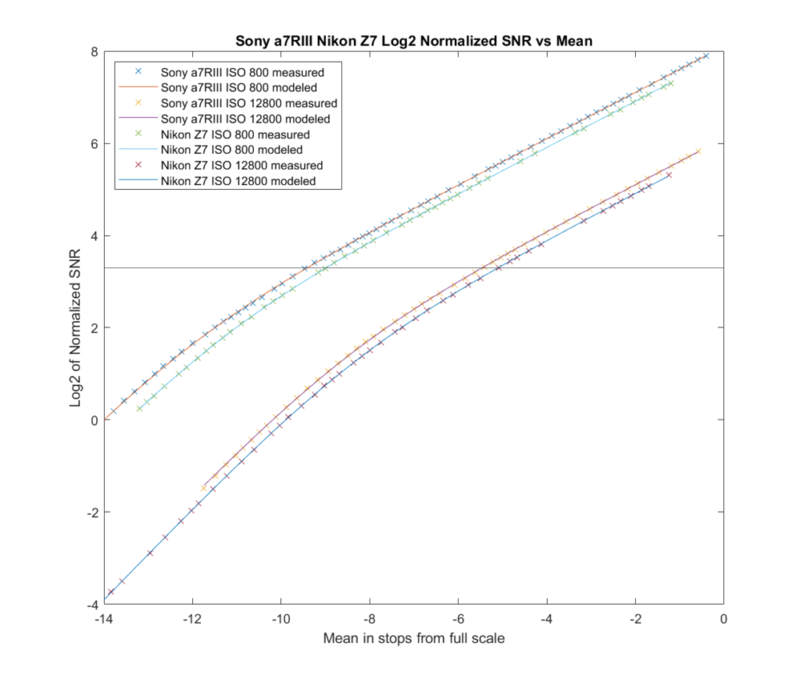 Differences in camera resolution are normalized out. You can see in the plot above that the cameras are dead even in the deep shadows, and that the Z7 does slightly better as things get brighter. I don’t consider these differences significant. Now the Sony looks better across the board, with the greatest difference occurring in the deepest shadows. 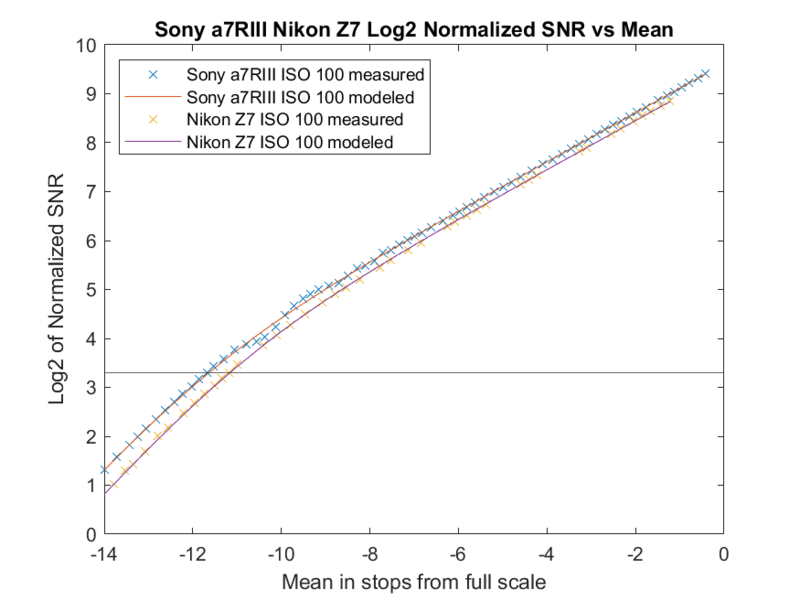 Now it’s a tie at the horizontal line, with the a7RIII doing better in brighter shadows, and worse in darker ones. None of these difference are a big deal, at least not to me. Bill Claff’s PDR tests for the two cameras yield similar, but not identical results. We use somewhat different methods.